Full of sparkle and friendship, this sweet chapter book series stars magical unicorn princesses and a girl invited into their world. Return to the Rainbow Realm, an enchanted land ruled by unicorn princesses! Cressida Jenkins, a girl who found her way there because she believed, is a frequent invited visitor, and readers will be thrilled to join her in the fun! In each story, Cressida is called to help a unicorn princess and her sisters in a magical adventure. 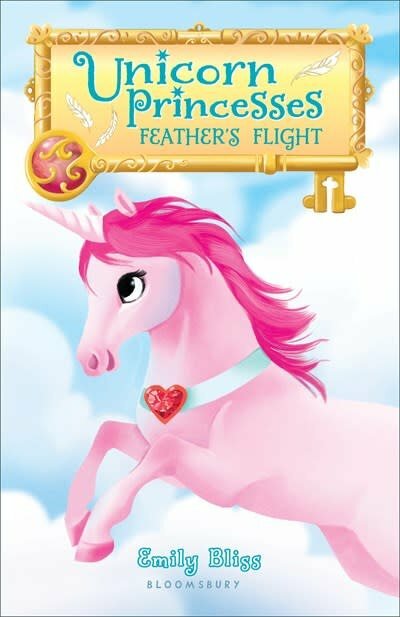 Cressida is surprised to learn that there is an eighth Unicorn Princess named Feather whose magical ruby allows her to fly! Feather is an explorer, and she's back from her latest adventure with exciting news . . . This must-have series has two new titles out simultaneously this season and features charming black and white illustrations throughout.